Hello, we have a local web service, now we need to restore and run it from backup to figure out some info. But we want do this via SureBackup using vLab to learn the technology. I made Virtual Lab (with isolated network, static mapping etc. ), Application Group and SureBackup task. Now when im starting the task the VM turns online and everything ok, i can ping it (static mapped ip address) but when i try to get web access from browser (access ip from static mapping) im logging to original web service, not the restored one. Web Service running on CentOS 6.9. If more info needed - just ask. You should use the mapped IP address instead of production one. 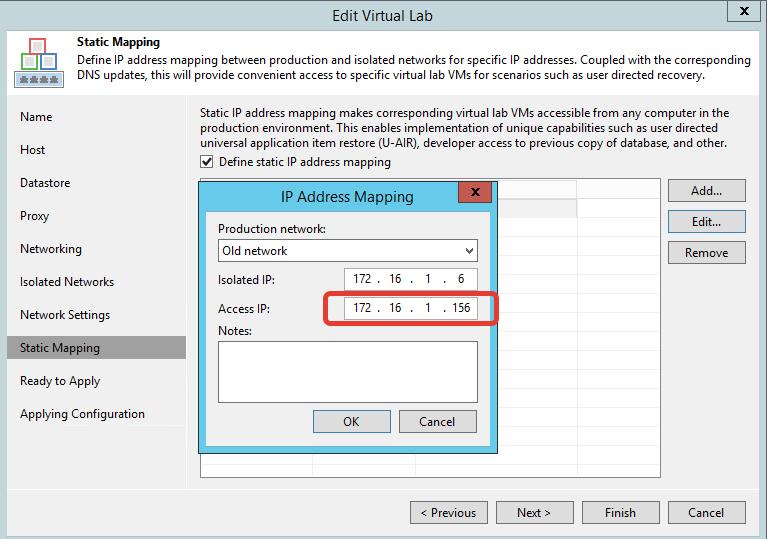 Check how to properly configure IP mapping here: Specify Static IP Mapping Rules and let us know if it helps. Cheers! Looks like i did it all right. IP i used to get web access is specified with red rectangle. Solved the problem, but not perfectly. Made another one ip forwarding in vLab settings, started SureBackup job and inserted new windows VM in the isolated network. This way i reached needed web access through the "inserted VM". Our problem was caused by DNS.